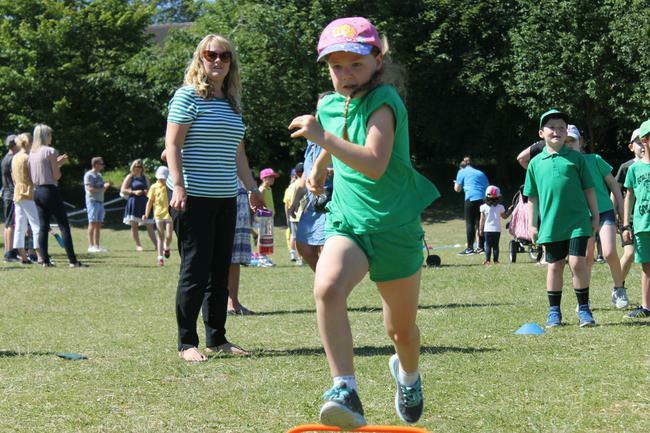 On Thursday 19th July 2018, Red House (the overall winners of this years’ house competition) were rewarded with a special visit by Multi-active who put on a morning of multi-sports for all of the children. 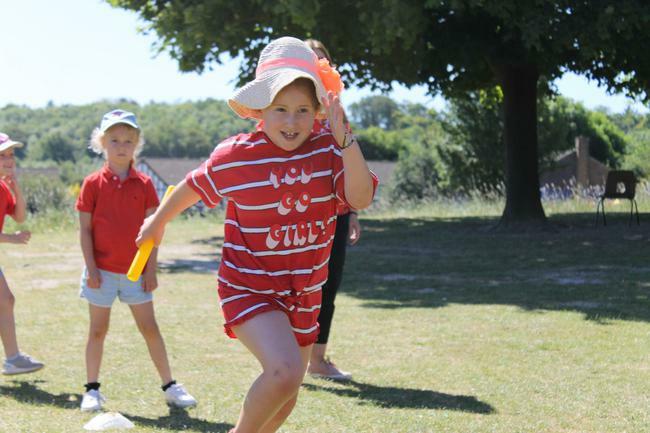 Everyone got to wear sports clothing for the day and we were lucky again with the weather; lots of fun was had by all (including the staff!). 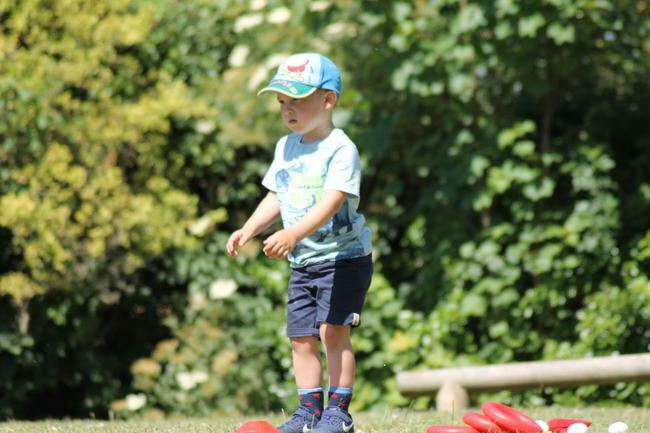 A variety of games and activities kept the children entertained throughout the morning and we can’t thank Brett and Dan enough for their efforts and enthusiasm during the morning. Another big well done to Red House (children and staff) for their achievement this year. Can they win the competition again next year? I’m sure Blue, Green and Yellow House will have something to say about that! The Year 4s got the delight of staying a night at school. In the morning they got an amazing treat organised by Mrs Lang - it was a graffiti workshop. This took place on the field under a nice shaded gazebo. We all got a plain white T-shirt and we got to do our own spray paint design. Because the man was so nice, and he didn’t want us getting it all wrong, he showed us all the different techniques of spray painting and then we were let loose to go and do our designs that we made. The teachers made sure that the best safety rules were put in place to ensure that we would be fine and safe. The nice thing was that everyone put their own personal touch to their T-shirt and we all took the tips that the man told us. They weren’t so strict that it was not fun they just made sure that we were safe .The teachers helped us too which was really nice for them to get their hands dirty as well .Everyones' designs looked amazing and nobody said they didn’t like theirs which was really nice that nobody doubted their work. 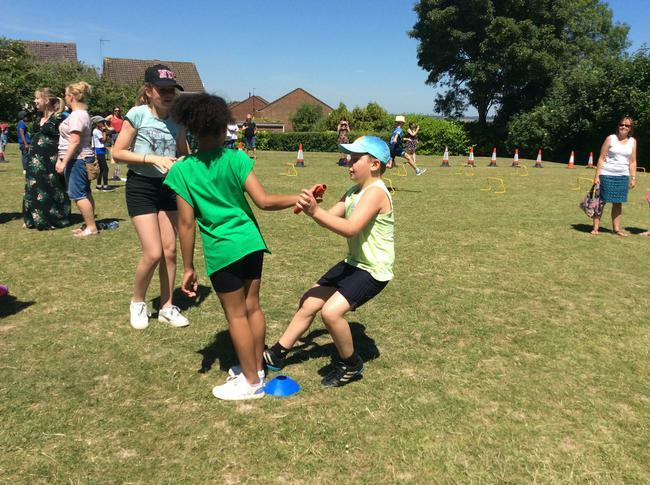 There was a lot of team spirit because we were all helping each other in lots of different ways which was really nice. Afterwards, we all got to have a picture with our amazing T-shirts and then we got to take them home with us at home time. Mrs Lang had put a lot of thinking into that as well, so I would like to say thank you for that. Everyone had so much fun and that was nice to see. I would like to say a special thank you to Mrs Lang for organising the whole sleepover. I would also like to say thank you to Miss Davidson, Mrs Harling, Mrs Caswell and Mr O’Neill for staying overnight and taking good care of us all night long. They even stayed up until midnight to see us all to sleep and to make sure we were all okay - thank you!!! They are the people that made the sleepover happen. THANK YOU! 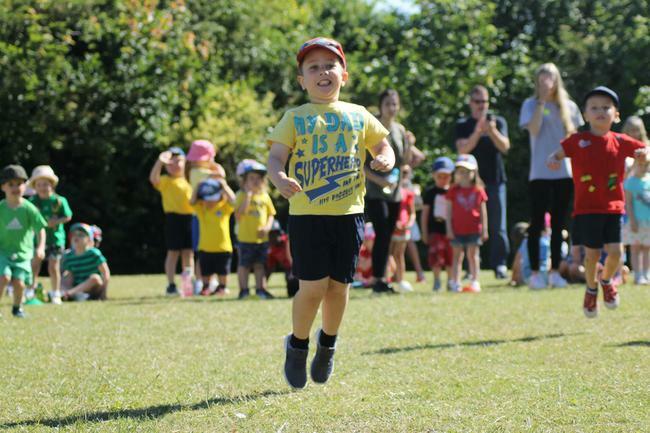 After the current heatwave, thankfully, Sports Day dawned cool enough for us to announce that it could go ahead and the fun could begin! 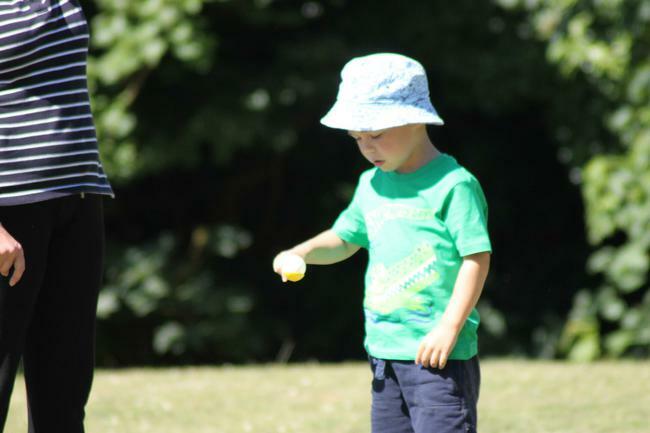 The children arrived with their sun hats, sun cream applied and plenty of water. Before we knew it, there was already a queue forming in the car park with parents and carers keen to get a good view of our Lark Rise athletes. 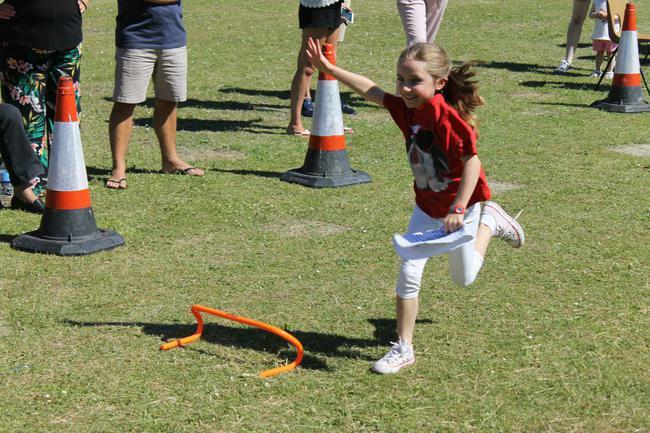 There were lots of different activities during the day and the children competed in their house against their rivals. 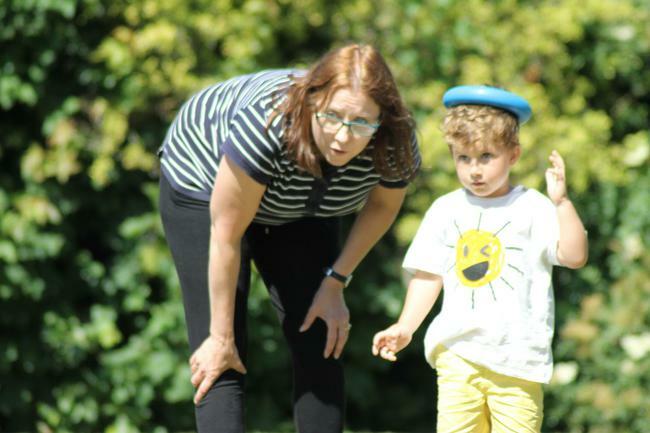 Lots of fun was had by all (including some of the parents/carers who joined in at the end) and there was a good level of competition throughout the day. 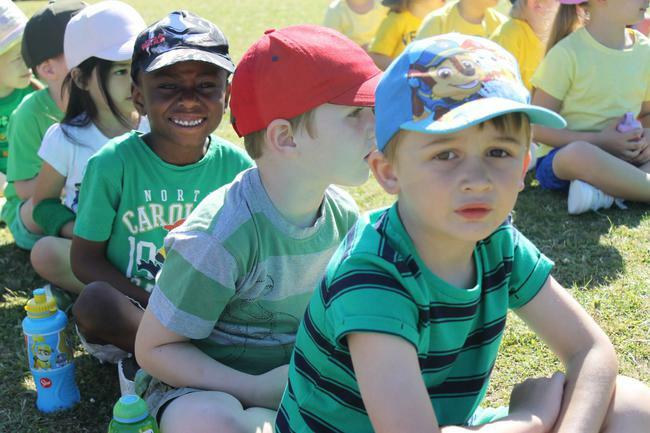 Plenty of rest stations meant that the children could rehydrate and have a break between their activities. A great day was had by all and thanks to those of you who came along to support the children and a big thank you and well done to all of the staff who organised a successful day. We will wait to hear the overall winners in each Key Stage to be announced in our end of year Sports and House assembly. 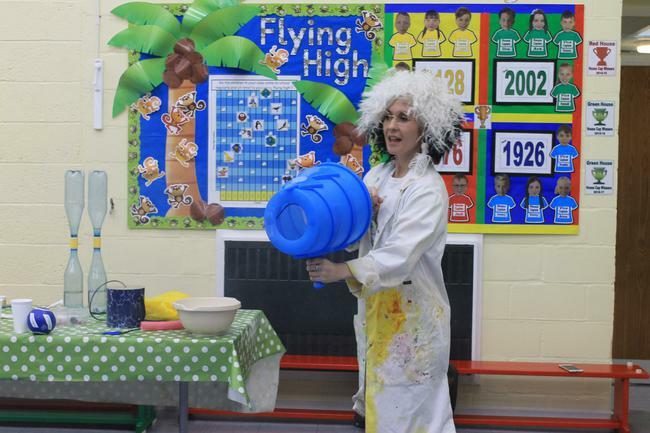 From 12th to 16th March, the school celebrated British Science Week. The theme of the week was ‘Engineering’ to link with the Government’s ‘Year of Engineering’ campaign. To kick off the week, the education team from the BLOUNDHOUND SSC Project presented to the whole school explaining why engineering is important and about their project to design and race a car that could reach speeds of over 1000mph. The children were so excited and asked some super questions. They also impressed our visitors with their science knowledge including use of the term ‘aerodynamic’. Over the next two days, all of Key Stage Two took part in workshops to design, test and race cars with the BLOODHOUND SSC team. Upper Key Stage Two enjoyed exciting engineering rocket powered cars and their designs reached speeds of over 50mph. The winning teams will have their names added to the fins of BLOUNDHOUND SSC. Lower Key Stage Two designed and built their cars using K’nex before racing them to find whose design had been most successful. 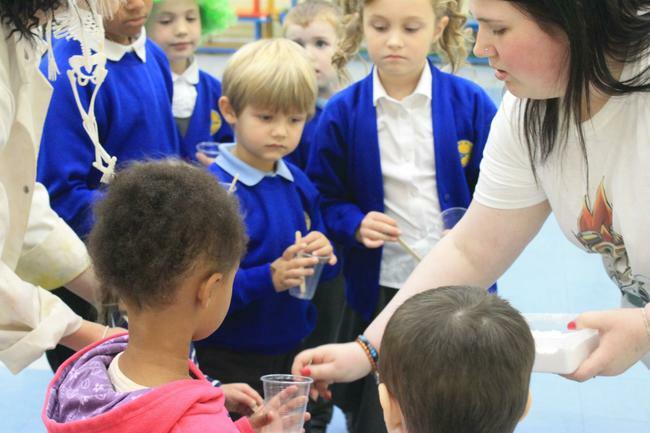 Children in Key Stage Two also took part in the online ‘I’m an Engineer’ event where they spoke to a range of engineers who work in the Space industry. They really enjoyed this event and came up with some excellent questions to pose to the Scientist including many around black holes. The event culminated with them voting for their favourite scientist. Lower Key Stage Two researched and presented information about female engineers. Children in Key Stage One and Early Years explored civic engineering. Owls and Robins exploring engineering based around transport. They particularly enjoyed testing the effect of different surfaces on how far and fast cars travelled down a ramp. Other activities included designing their own mode of transport and sharing their excitement and knowledge of the BLOODHOUND SSC assembly through independent writing. 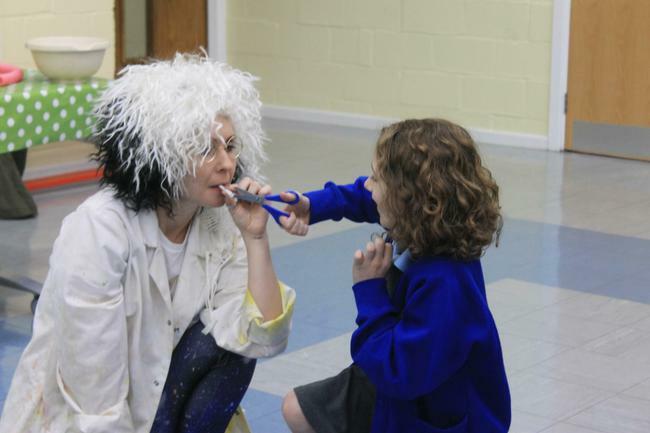 Key Stage One also took part in an ‘Astro nappy’ investigation to find the most absorbent material to use for special nappies for astronauts. They also considered how even animals are engineers by researching, designing and making a bird’s nest. 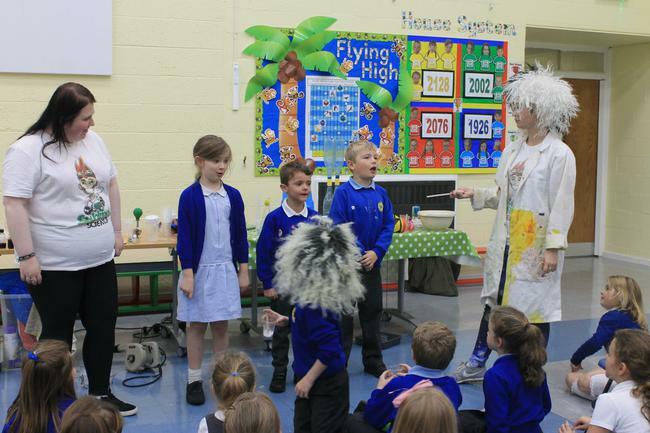 Children made links with Science in other lessons including poetry based around elements of nature and rainforests. The children also worked really hard at home creating amazing marble runs. There were some really imaginative feats of engineering and Mrs Hearne loved looking at the various designs. 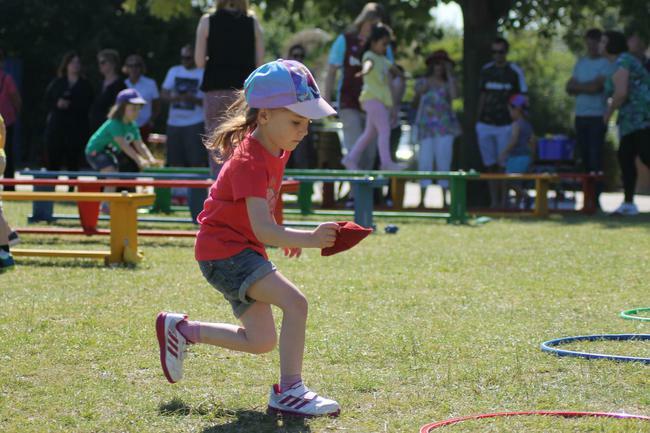 It was particularly delightful to see how much fun children had with their parents and carers in creating these marble runs and we would like to thank you once again for your amazing support of your children in their science learning. I have yet again been overwhelmed by the support given by the children at Lark Rise Academy in supporting the two rural schools in Sarenga, West Bengal, India alongside the mission hospital, Khristiya Seva Niketan (Home of Christian Service). Goal 1… Children were to wear non-uniform on 24th January and pay £1 for the privilege. This date was chosen because it was ‘National Girl Child Day’ in India and the opportunity was taken to share how fortunate the children in the UK were; especially girls, and how everyone at school is treated fairly and equally. The children were able to see and hear examples where this is not the case in India; and how the girl child is often treated with prejudice and unfairly. The children were able to discuss how this tied in with the school Rights to be safe; to be included; to learn and to be happy. The money raised was to sponsor a girl child in a safe house in India, giving her the opportunities that the children at Lark Rise enjoy and take for granted. Upon my return, I was able to share in an assembly about ‘Relationships’. One of the most moving things I experienced in India this year, was the moment when I was given the details of the child that Lark Rise were sponsoring. I was very touched to think that children in the UK cared deeply enough to raise the money to make such a difference to one child’s life; it was an amazing and humbling experience to hear the difference this sponsorship would make. Educational supplies – stationery, books, etc. 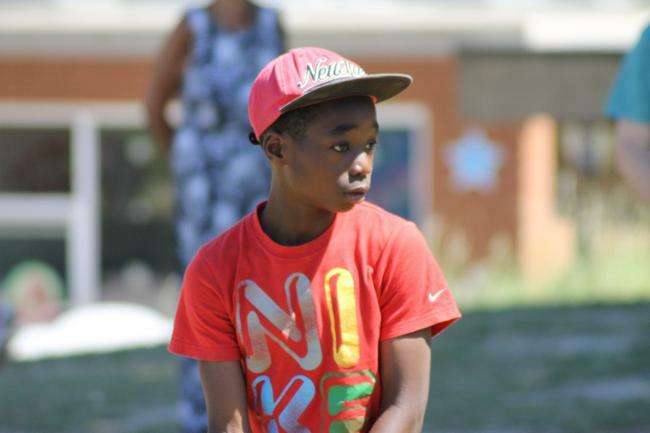 After school clubs (music, art and dance) etc. So CONGRATULATIONS Lark Rise!! You are now supporting a girl child called Anjana; she is 10 years old and lives in a safe house. Her mother (a housewife) and her father (a contractual labourer) are very poor and they live below the poverty line. Anjana has been taken to the safe house as both her parents have been sold as slaves and she was left alone. Anjana is being looked after by the Diocese of Durgapur. Her favourite lesson, like many of you, is Science and she loves drawing. It was really lovely to receive a photo of Anjana with the gift pack that had been taken out from the children of Lark Rise … it contained a pencil case, colouring books and, of course, a Lark Rise teddy – which she loved. Well done especially to the team of UKS2 girls who organised a cake bake sale and raised enough money to sponsor Anjana for the second year. You have been great role models in showing enthusiasm, dedication and passion to organise and motivate people around you to support the cause. I am proud of your achievements… Other children have sold loom bands and donated other things to the trip for which I am also extremely grateful and awestruck. You are all incredible! Goal 2… Following a POWWOW based on RE and some of the comments that the children had made in KS2, I decided to hold a competition for a Mehndi design. The children were challenged to design a pattern, based on traditional Indian patterns. The two winners (chosen by someone from India) were painted on my palms, in henna, by one of the student nurses at the mission hospital where I stayed. Congratulations to the two winners (one from EYFS/KS1 and one from LKS2/UKS2). 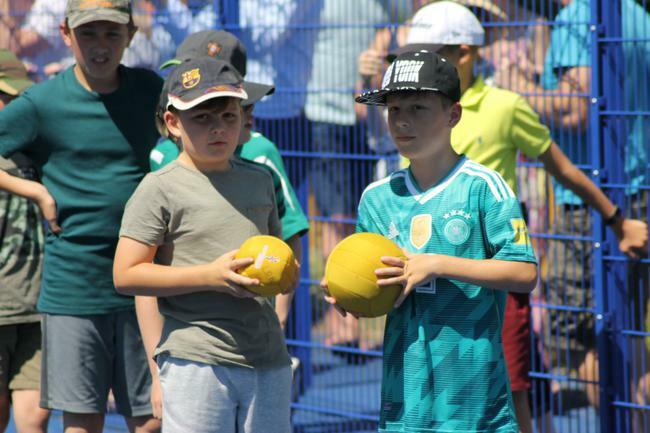 Goal 3… Children were asked to think of a game or lesson that they had enjoyed that could be taken out and shared… it had to be light and small (luggage allowance! ), not expensive to resource, did not waste natural resources that we take for granted in the UK (like water), cross the language barrier and most importantly be fun! 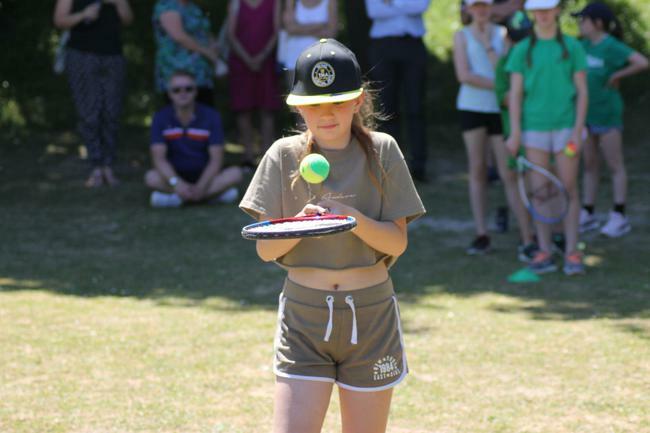 This was a competition winner suggested Sweet Pong… if the ping pong ball landed in a pint plastic cup from a distance, the child who threw the ball won the sweet that was in the cup. This was successful – thank you Fern! – you have won five coloured coins for your House. Goal 4… Due to the success of providing each school child at both rural schools with a piece of fruit last year, this again was set as a target. This ensured that the children had a nutritional fruit snack and supported the local economy. 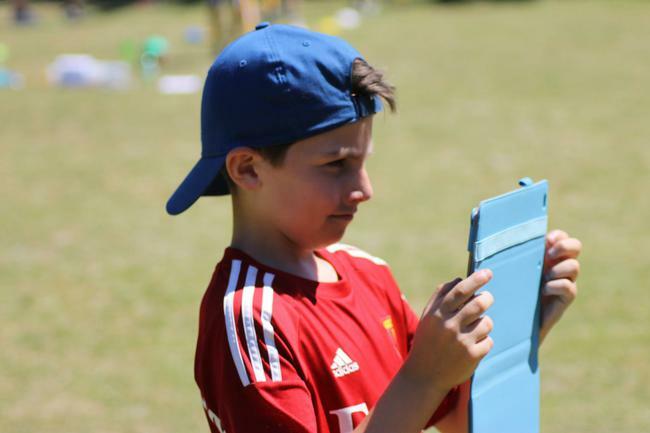 Goal 6… Raise enough funds to support a learning activity in both rural schools. 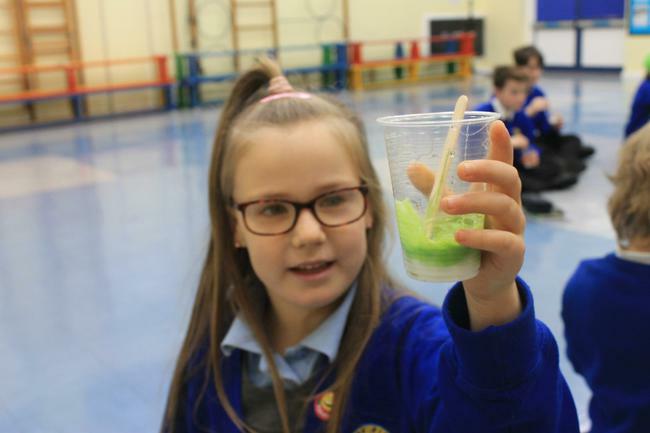 The children at the two tribal schools enjoyed making giant bubbles after formulating the bubble mixture, carefully measuring out the ingredients and stirring the concoction. 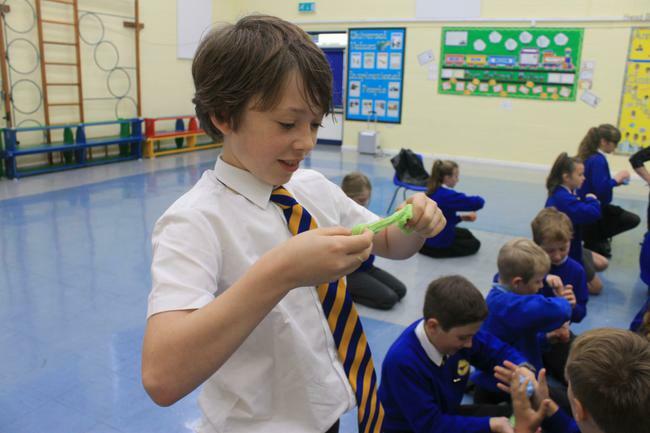 Some great results were achieved and all children made their own wand with straws and string… excited squeals could be heard as the children then fashioned their own giant bubbles. Well done Lark Rise, I am proud to be an ambassador of the school when I visit India and I am touched by your love, care, generosity and compassion for those so much less fortunate than yourselves. You have made a difference to many childrens' lives. 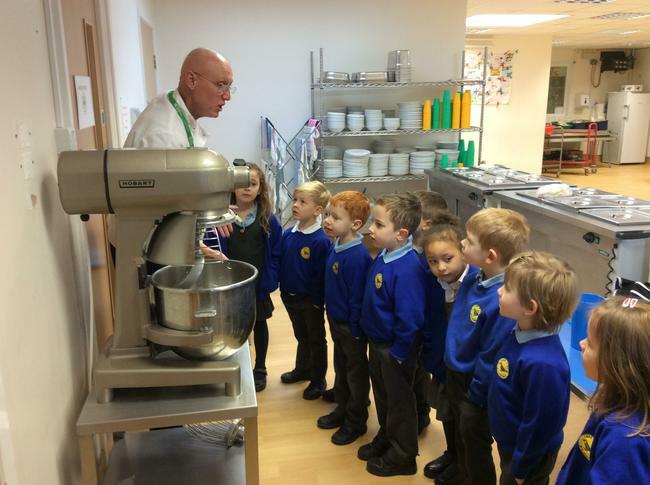 We have been learning about the story of the Little Red Hen and were fascinated about the process of making bread. 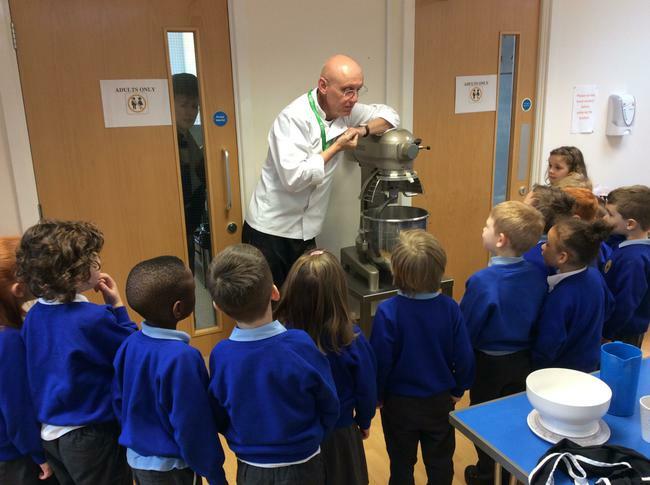 We were extremely lucky to have a visit from Mr Hobbs from our school catering company who taught us how to make bread. We all took part in mixing the ingredients, even adding herbs and raisins. We had to knead the dough and create our own shaped bread buns.. It was tough work on our muscles! 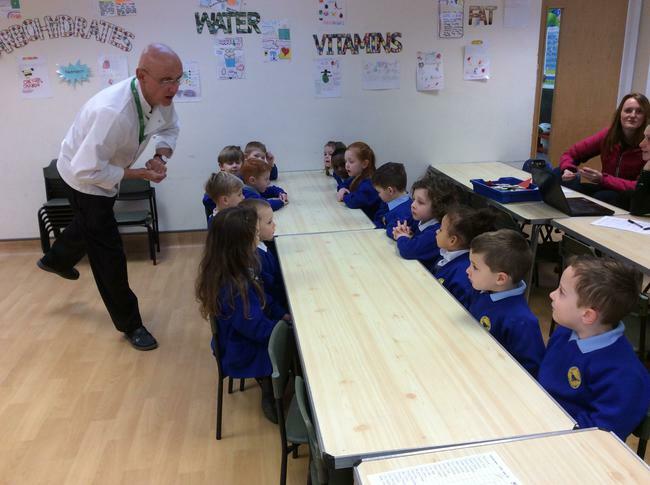 Once the bread had cooked, the smell drifted to our classroom! It smelt amazing. The children in Key Stage One had great fun this week learning to ride their scooters safely. 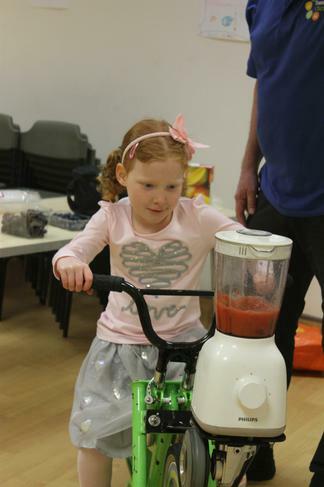 Thanks to Derek Smulders and Alister Barclay from Sustrans for providing this opportunity for the children. Congratulations to two children who had their designs drawn on Mrs Berry’s hands on her recent trip to India. The competition came about as a result of one of the class POW WOW sessions about Religious Education (RE) where some of the children had identified Mehndi patterns as something they wanted to learn more about. Mrs Berry decided to turn the comment into a competition open to the whole school. The children were challenged to design a traditional Indian Mehndi pattern with the two winning designs (one from EYFS/KS1 and one from LKS2/UKS2) to be painted on her hands in henna. The winners also won five gold coins for their house team. The artist who was copying the children’s designs was very impressed with the designs – so well done girls! 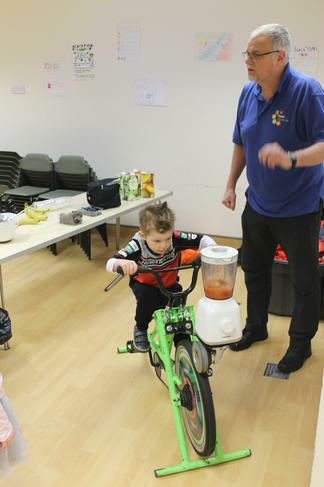 We ended the half term with a Bikers' Breakfast provided by Sustrans. 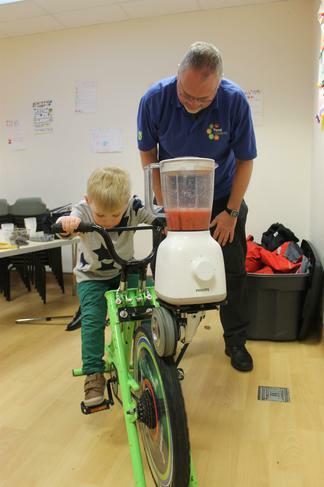 Derek Smulders (Schools & Community Officer, Sustrans) brought along his Smoothie Bike and the children were given the chance to make their own smoothies using pedal power. Safer Internet Day 2018 was celebrated by the children of Lark Rise on Tuesday 6th February 2018 with the slogan “Create, Connect and Share Respect: A better internet starts with you” being the main focus for all the children. The children across the whole school completed a range of activities throughout the week to highlight the global challenge to increase children’s awareness of how to stay safe when using the Internet. The children joined millions of people globally supporting the campaign to make the Internet safe for everyone to use now and in the future. They were amongst more than a thousand schools across the UK learning about using technology responsibly, respectfully, critically and creatively. The week started with an assembly by Mrs Shilvock and Mr Ray who explained the campaign and activities for the week and finished with a celebration assembly showing off the children’s learning and understanding. The children in the Nursery told us all about Smartie the Penguin and how he had helped them to learn what to do when things go wrong or things on their tablets or computers are not nice. He uses the song ‘Before you tap and click… You need to stop and think… And TELL someone!’ they sang this well to the rest of the school and explained what happened to Smartie in their story and how he learnt to stay safe. In the Reception class the children learnt the story of Buddy the dog and how he helped his owner Ben use computers and tablets sensibly and safely. They learnt how to make sure they always tell an adult if things go wrong and they do not know what to do. The words of Buddy’s song are ‘Ask your grown-up, Ask your grown-up, Ask for help! Ask for help! Use your tablet safely, Use your tablet safely, Woof, woof, woof! Woof, woof, woof! ‘. In Key Stage One the children had a wide range of ways of passing on their knowledge of internet safety. Some learnt a rap to help them remember a set of rules to how to stay safe and performed this confidently to the rest of the school, whilst others created the word SMART and wrote on it what each of the letters meant to them. They finished by performing a cheer leader style song with words about being careful what they use the internet for. In Lower Key Stage Two the children produced posters to tell other children in their key stage what the best way to use the internet is and how to keep your personal details safe and therefore keep you safe. This was followed up by another class who did a small play with children playing different people using the internet in different ways. In Upper Key Stage Two children made pledges and shared these with the school so that other people knew what they had decided to do when they use the internet at school and at home. Another class performed a play which showed the dangers of incorrect use of social media and how their actions could affect others if they do not think respectfully. The assembly was finished by a joint performance by two Key Stage Two classes, who hijacked the screen to tell others about how they had to teach their teachers a lesson on how not to let people use their usernames, passwords and devices. This made us all smile while also teaching us some very important lessons. The Year 4 children went to London on Friday 26th January to visit the Houses of Parliament. Our visit started by looking at the history of the Houses of Parliament in an amazing 360 degree cinema in the Education Centre. The children were engrossed in watching the film and we all learnt so much. We then went inside the Houses of Parliament .... what an incredible place! One child said "I have seen it from the outside before and I didn't think I would ever go inside." Our tour guide told us so much information and we even got the opportunity to take in the roles of Prime Minister, Chancellor of the Exchequer, Education Secretary and other Members of Parliament to role play how a motion is passed in the House of Commons. We were then extremely fortunate to be able to go inside the House of Commons. We saw the huge chair that the Speaker of the House, John Bercow, sits on and even saw where our Prime Minister, Theresa May, would sit. The children were fascinated and asked so many questions. Our tour guide commented at the end of our visit how impressed they were with our children's knowledge and well thought out questions. Well done Year 4. What a fantastic experience we had and what a credit to Lark Rise you were. 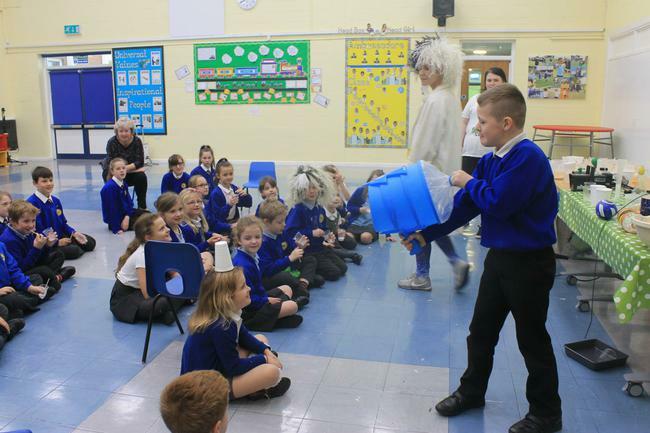 On Thursday 25th January, the children and staff in Upper Key Stage 2 were given the opportunity to go to watch the pantomime, ‘Peter Pan’ at Queensbury Academy. The children were really well behaved and it was an excellent production – it was especially nice to see a few familiar faces in the cast and something lovely for our children to aspire to be in. The Morning and Afternoon Nursery children joined together this morning for their Christmas party. 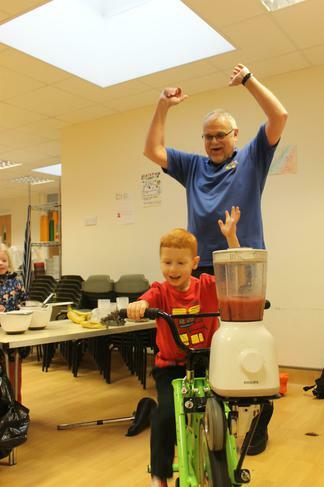 They enjoyed lots of party food, party games and a special visit from Magic Dave, a children's entertainer. On Tuesday 28th (Year 6), Thursday 30th (Year 4) November and Friday 8th December (Year 2), some of our ‘home grown’ athletes attended a Sportshall Athletics Tournament at All Saints Academy. 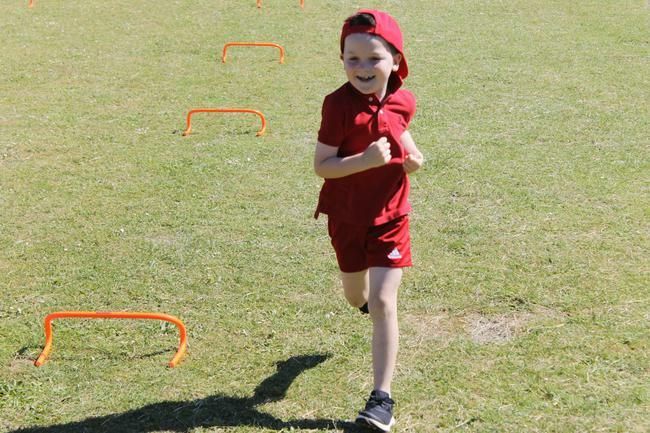 All of the events were extremely well organised by the staff and students at All Saints and all of the children enjoyed a morning of track and field events against local schools. They all excelled and competed in relay races, hurdles, speed bounce, javelin, chest push, five strides, vertical jump and long jump. 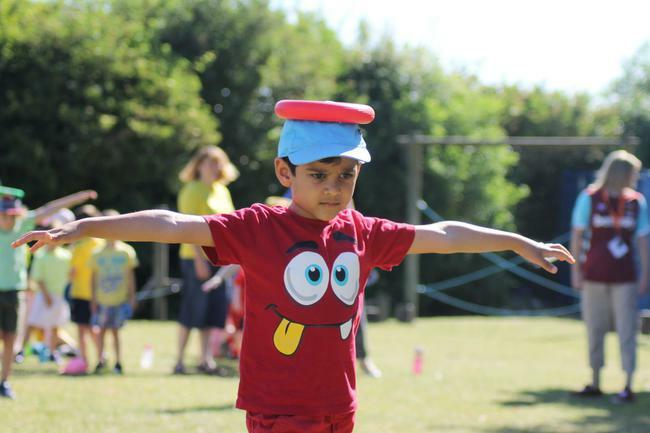 As a team, the children displayed exemplary behaviour, cheered for each other and congratulated everyone throughout the morning. 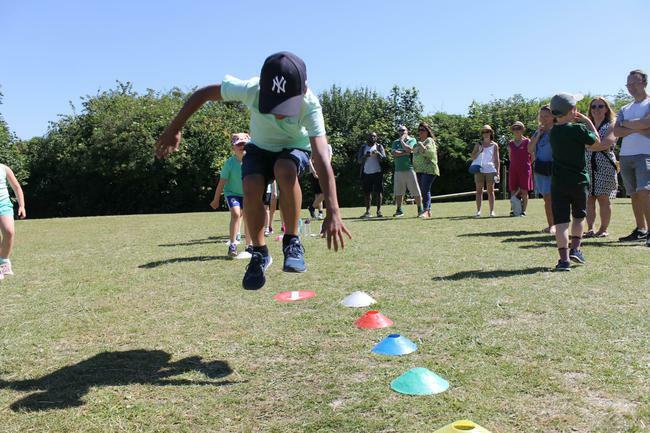 The children competed and gave their all in the field events and particularly excelled in the track races and relays, resulting in some very close finishes which kept us all on the edge of our seat! Mr Page got in on the act and took part in a running race (cheered on by the Year 2 children) but put his third place down to a bad back and shortage of snacks in the morning! We would like to say a huge well done to all of the children who took part in the competitions. 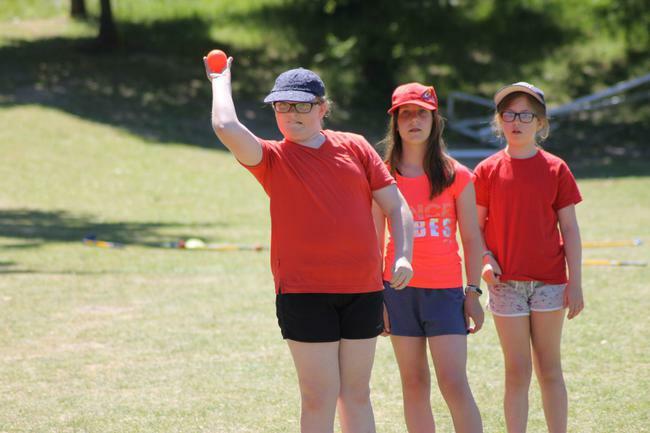 Their efforts clearly showed how much hard work they have put in over the past few weeks and that is testament to their teachers for putting in all their hard work too. 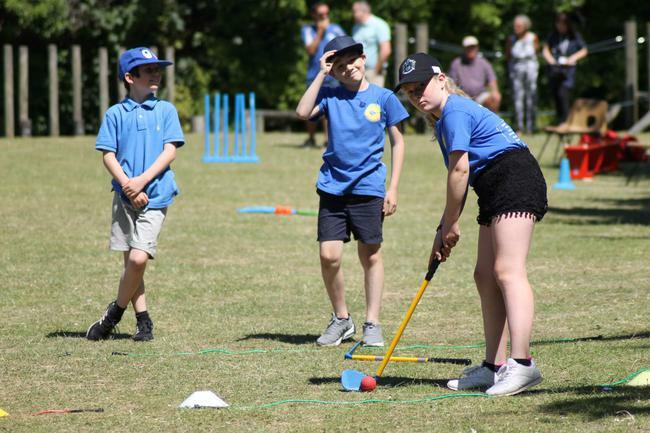 Overall, the Year 6 children finished in second place (out of eight schools), the Year 4 children finished in third place (out of eleven schools) and the Year 2 children finished in second place (out of five schools). 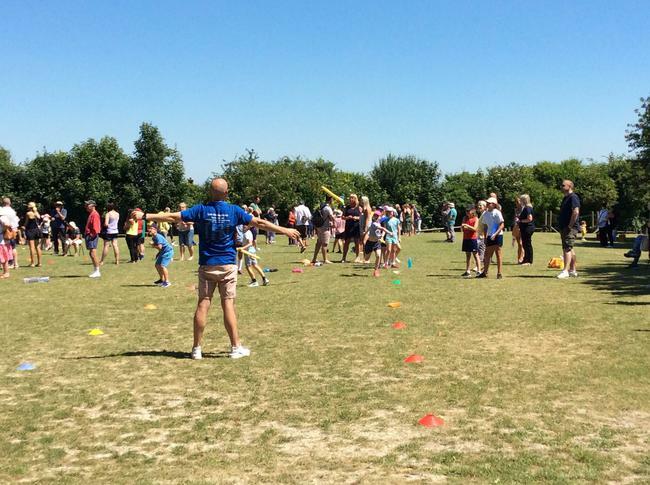 We would also like to say a big thank you to Mrs Hunt (Year 6), Mrs Crampton (Year 4), Miss Branscombe (Year 2), Miss Warren and Mrs Gransby (minibus) for supporting the children throughout the morning. And of course to all the teachers who have coached the children this year and selected the teams for the competitions. A big well done to everyone involved! P.S. We have some spare footballs, basketballs and rugby balls at school due to our equipment being updated. They still have lots of life left in them. If you would like one (and have obviously read this article!) then please write down on a piece of paper which place all of the year groups finished in and bring it to Mr Page. There are fourteen prizes available so it is first come first served! Premier League trophy arrives at Lark Rise! A morning of surprise and excitement awaited all of the children and staff at Lark Rise staff as the Premier League trophy arrived at Lark Rise. 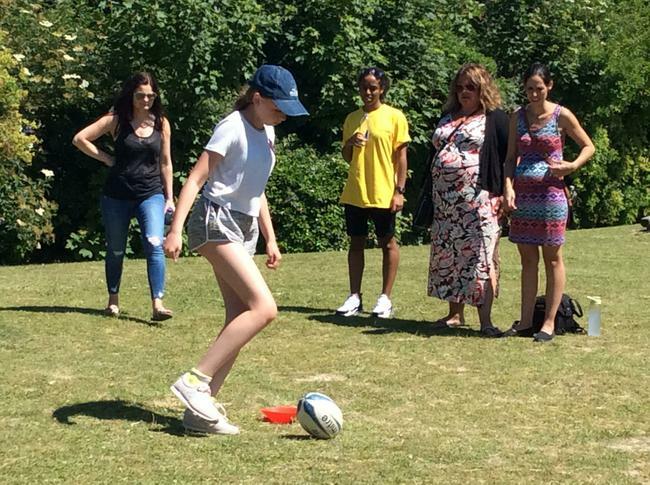 Having already been sent a new football kit, box of fabulous reading books and a sports holdall full of sports equipment linked to Mathematics and English, the trophy itself was to be the icing on the cake. Being only one of the twenty two schools across the country to have been selected (a big thank you to Mrs Bradshaw for nominating us via Heart FM!) we were truly privileged to get up and close to a famous piece of football history that has been raised in the air by footballing greats such as: Thierry Henry, Cristiano Ronaldo, John Terry and Sergio Agüero. There was a real ‘buzz’ around the hall as music was played from 8.45am as the children made their way through the school entrance to their classrooms for registration. The morning then ‘kicked off’ with a whole school assembly and we welcomed representatives from the Premier League, coaches from Luton Town Football Club and Harry the Hatter! 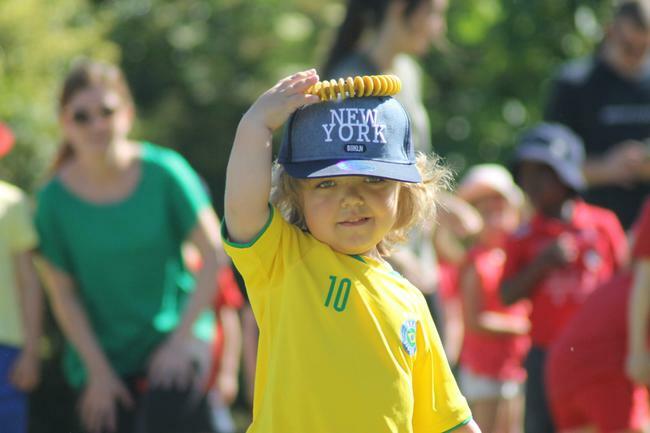 The children learnt about the Premier League values, which encourage them to be ambitious, inspiring, connected and fair. 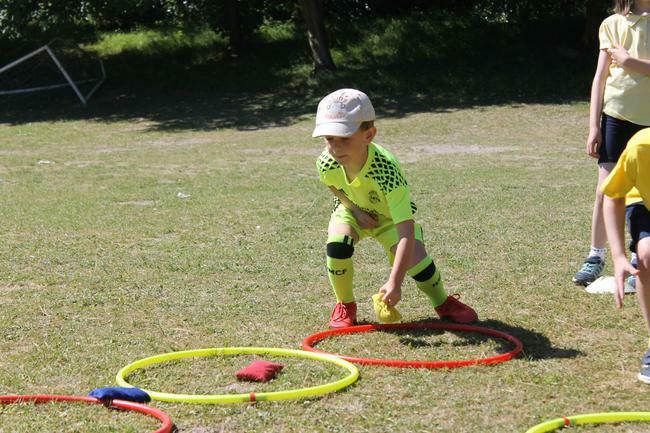 The Premier League then organised a range of activities alongside Luton Town FC coaches, which included: photographs with the trophy, football sessions outside and classroom learning that linked football with a variety of subjects. 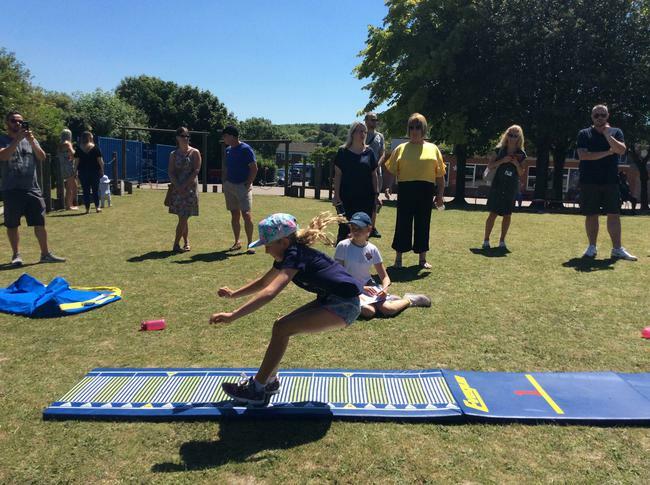 As Mrs Daulman wrote in the newsletter, this truly was a ‘once in a life time’ treat for the children (and staff) and one that will be remembered for a long time. I would like to thank Mrs Bradshaw for nominating Lark Rise, not only did we get to host the trophy, we also have a whole range of resources and equipment to inspire the children further with their learning both in and out of the classroom. 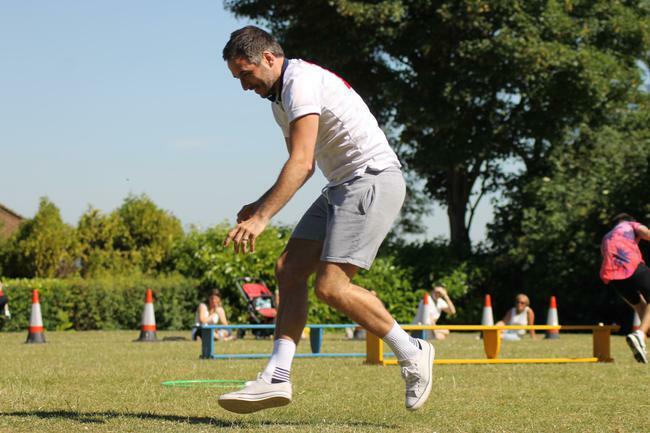 The Premier League representatives ensured that the morning itself was plain sailing and extremely well organised as soon as the children arrived at school and the coaches from Luton Town FC ensured that lots of children acquired new football skills whilst having lots of fun outside. A big thank you to all involved! "I had a cup on my head which was shot off by an air cannon. 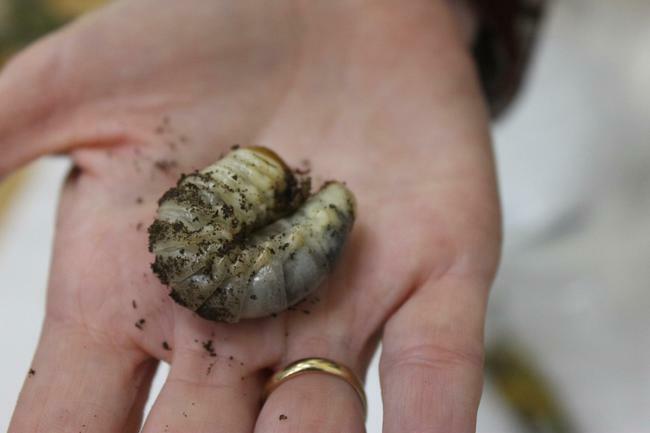 The air waves travelled through the air and pushed it off." "There was a bottle of lemonade and we put seven mints into the lemonade and it exploded into the air really high; it was very cool." "We had a big, long, plastic tube about two metres long that someone had to fill with one breath! The trick was to line up with the bag, stand slightly back and blow into it with one puff. Then the person had to hold tight and when it was inflated close to the end." "We made some slime. The slime was squishy. I mixed in some 'Troll snot' to make it a blue colour." 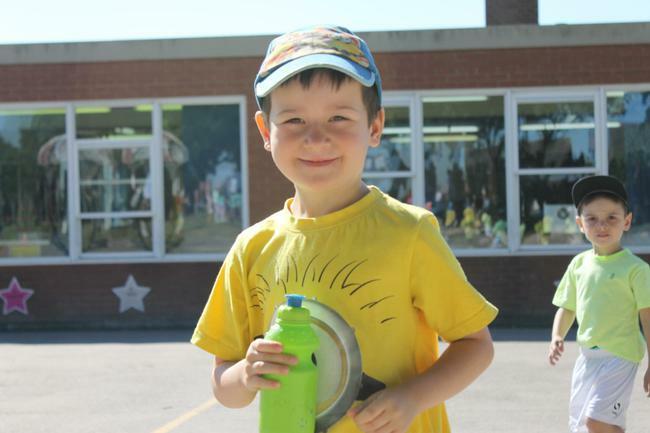 "We made an awesome explosion with a lemonade bottle which I pumped air into. The bottle made an impressive rocket that landed in the Upper Key Stage Two playground from the ground outside Key Stage One. It was amazing." " We made sherbet. We had to get three ingredients from different stations to make the sherbet. They were icing sugar; bicarbonate of soda and citric acid. It tasted sour just like the sherbet you buy." "I made dragon snot slime. It was squashy." " We made our own sherbet. It tasted sour like the normal sherbet but the texture was different. We also made slime. Making slime was really fun. My slime was coloured with Troll snot!" In our Diwali assembly we enjoyed hearing about how Diwali is celebrated. We watched a clip in which a family showed us the many ways they celebrated and enjoyed seeing the gifts and food shared at the family celebration. We thought about how our friends and family might celebrate and Mrs Taylor shared the diva lamps she had been given by Sangita’s family and described how Sangita’s family would be visiting the Temple. The children thought about the story of Rama and Sita and the significance of the Diva lamps being lit in the story. We also thought about how Diwali is a time of new beginnings and how this is celebrated around the world. We finally thought about what we could learn from this festival and thought about if there were any areas we would like a new beginning or fresh start in. Taste so good to me! At Lark Rise Academy’s Harvest Festival on Friday 13th October, the children and staff sang a number of songs with gusto to celebrate this special occasion. Throughout the assembly, there were lots of reminders of how lucky we all are to have plenty of food and that it is important, at this special time of year when the farmers are gathering their crops, to think of those people who may be in need and may be hungry as they have little food to eat. Major Steve Brevitt, from the Salvation Army, was welcomed as part of the assembly and he reinforced this important message by talking to the children about the word ‘harvest’; he showed the children many of the other words that can be made using the letters in this word…such as ‘starve’ ‘eat’ and ‘share’. The children were keen to share their food from home in order to help others and, as a result, a lovely Harvest Festival display was created. It was made up of cans and packets of food which were taken after the assembly, by Major Steve, to the food bank at the Salvation Army. 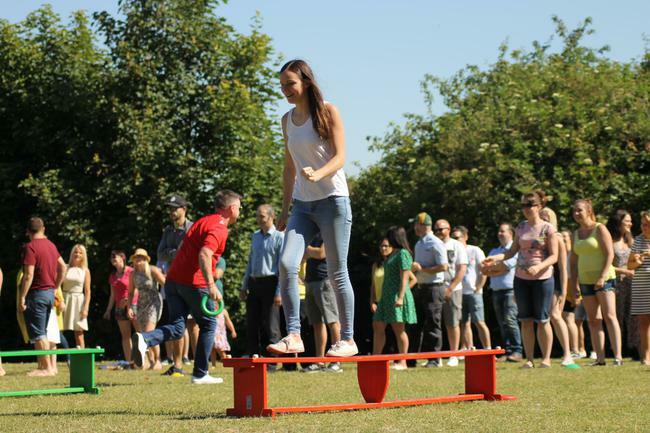 Lark Rise’s festival celebration was a joyous occasion enjoyed by all of those present and it is hoped the food donations will benefit those in need too! 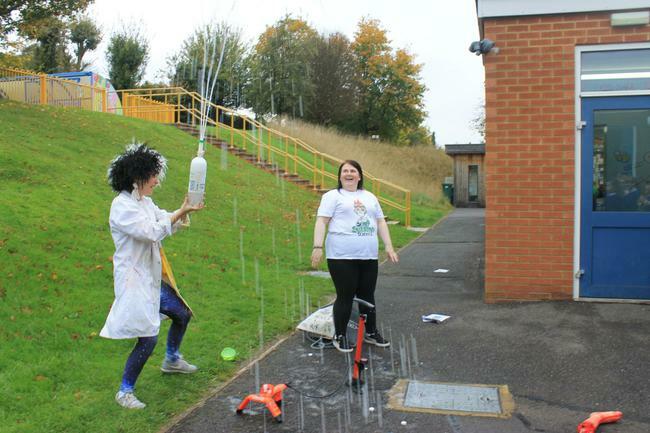 From 9th to 13th October, the school celebrated National Biology Week. 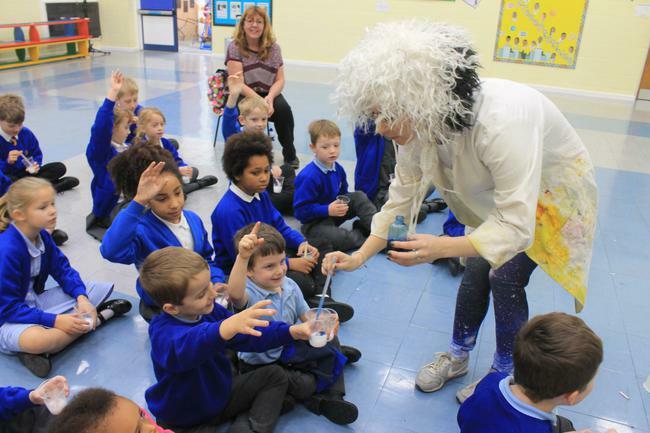 We started when I shared an assembly with the children to talk about famous biologists of the natural world and how many were also intrepid explorers from Charles Darwin to David Attenborough today. 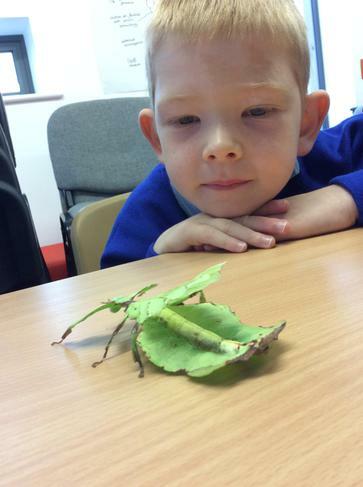 The Chairman of the Bedfordshire Natural History Society, Dr Wilf Powell, visited the Nursery and Reception children to show them a variety of artefacts related to local nature. This included a mink skin which the children really enjoyed touching! He was also kind enough to leave a number of items for children to share in their classes throughout the school. On Tuesday, Deborah Harvey from the Royal Holloway University came in to talk to the whole school about Biodiversity and some biodiversity projects the University are running that we can take part in as a school. It was extremely informative and the children loved seeing moth and beetle specimens up close using a visualiser to magnify them on the large hall screen. The excitement of all children was clear to see in our visits from Teaching Talons. 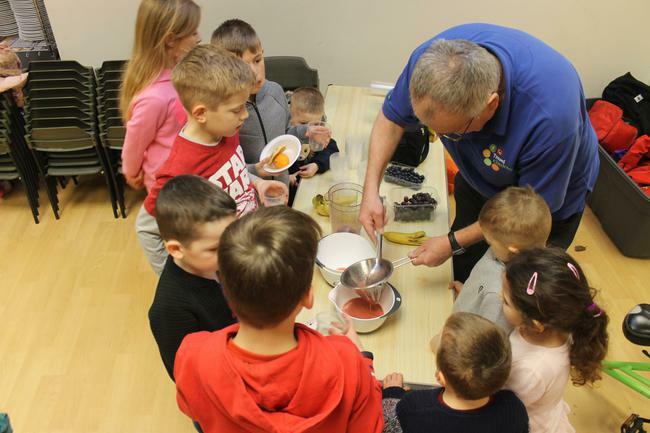 Children took part in workshops linked to their National Curriculum science learning objectives such as the themes diet, adaptation, minibeasts, rainforest and nocturnal animals. 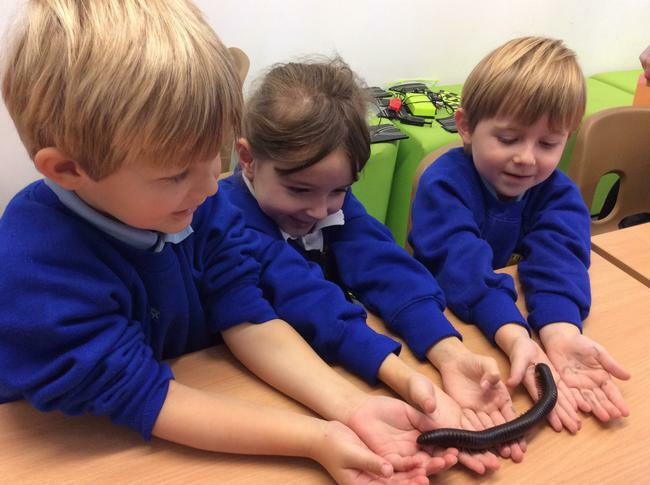 Children enjoyed seeing and handling a range of animals including the largest stick insect which was extremely leaf like, cockroaches, owls, snakes, tortoises, guinea pigs, tarantulas and giant millipedes to name a few! They also saw a Tenrec which is an animal from the Madagascan rainforests that looks very much like the hedgehogs we are familiar with. 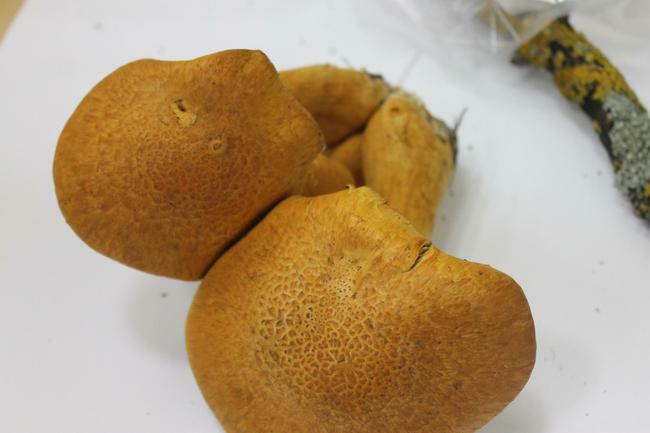 However it is not a hedgehog but in fact related to elephants and aardvarks! 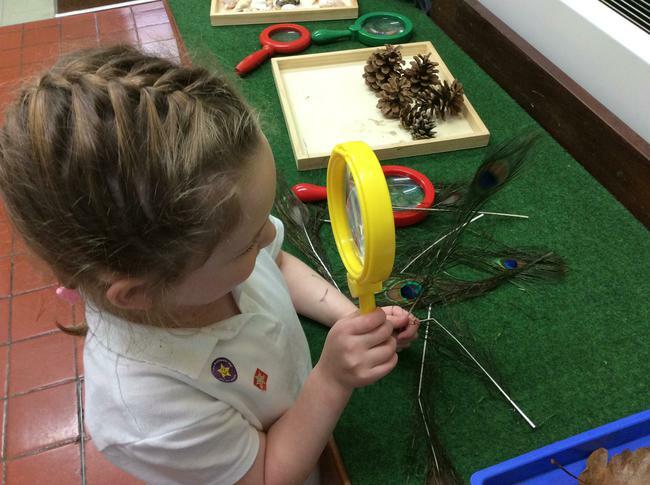 Key Stage One enjoyed a trip to the Natural History Museum at Tring on 13th October. Here they had a chance to explore the range of galleries containing the famous specimens belonging to Walter Rothschild as well as participate in museum run learning workshops on the topic of animal classification. We were also really pleased to welcome Jules Howard to school on Friday. Jules is a highly knowledgeable science author who regularly writes for the Guardian and the BBC and has also appeared on the One Show. He is passionate about fossils and through his company PalaeoLabs teaches children about fossils and evolution. 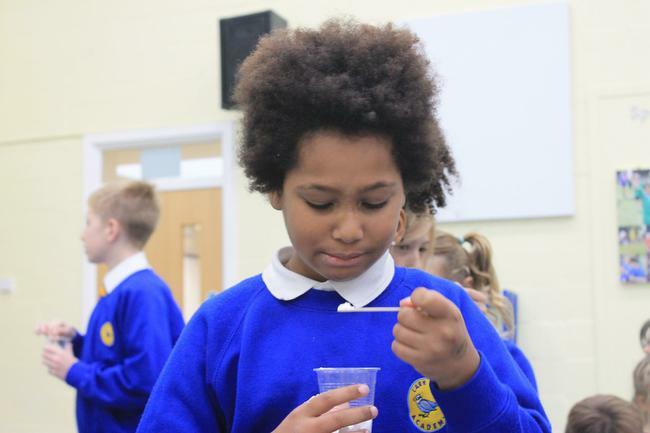 The children enjoyed learning about fossils, evolution and Darwin and he was fantastic at letting the children be hands on with his artefacts including a rock specimen that is over 1 billion years old! Several children and their parents/carers came back after to school to talk to Jules and I think they agreed with me that he is truly inspiring! Lastly, the children created some amazing entries about extinct animals, famous biologists and the plants and animals to be found in a variety of countries.